So, you have Ubuntu Gutsy Gibbon's compiz-fusion and want the cool toys like fire writing? For most of them you will need the "super" key (aka windows key), otherwise you need to reset the key combinations which enable the plugins. Before you begin you should ask yourself: Can my card and computer handle it? If you're unfamiliar, you can go to ubuntuforums.org and post your computer configuration (graphics card, memory RAM, processor and its MHz/GHz), ask them if they think is plausible to use visual effects. Firstly, we need to setup the software sources, i.e. use the universe. On the menu: System > Administration > Software sources (Type in your password). Since I'm not a source repository fan, I have mine unchecked, you can go ahead and check it, it doesn't hurt to have the source ready for download :) It will ask for you to Reload the data, do that, it basically updates the information about the packages, it may take a while to download the data. Secondly, make sure you have the appropriate (restricted) drivers for your graphics card (Nvidia NX7300GT in my case). 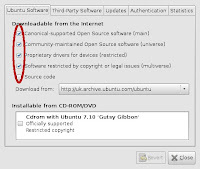 You can install them by going to System > Administration > Restricted drivers manager and checking Enable next to your card. Be sure to restart your computer afterwards. enable the visual effects through System > Preferences > Appearance > Visual effects and select the Extra or Custom if your system supports it (see paragraph 2). You might require a restart, although Ubuntu restarted the desktop manager for me. Finally you can click on Preferences there, or System > Preferences > Advanced Desktop Effects Settings to have complete control over the plugins that are loaded. It may take you a while to get used to it. Would you be able share green colout template with everyone. I have got the red one going. You can also grab the images and upload them on your own space. You could do it on your own actually, you just install GIMP, open the image.